Today in bad movie news: The Asylum is going theatrical! Yes, the makers of everything from the popular Sharknado series to mockbusters such as Transmorphers or monster movies such as Sharktopus will be taking a theatrical bow this fall, with “Thursday Nights at the Asylum.” Partnering with Cinemark Theaters, the studio will be releasing some of its more infamous creations into theaters for a series of one-night-only screenings. First up: 2012’s 2-Headed Shark Attack, which screens in select theaters nationwide at 10:30 p.m. EST on Thursday, Sept. 28. Tickets are cheap: Just $5 a pop, or $10 if you want to take home a digital download of the film you’re watching. Most of these films have been distinctly of the “direct to VOD” or “premiered on SyFy” variety, so for the majority this will likely qualify as their big screen debuts. Future installments will include the dubious likes of Zoombies, a film about zombified zoo attractions, and Zombie Spring Breakers, which is … well, pretty much what it sounds like. It all builds up to the latest Sharknado entry, Sharknado 5: Global Swarming on Thursday, Nov. 16, which sadly wasn’t our cup of tea when we watched it for the August premiere. Uh huh, sounds about right. If you enjoy a nice bit of dreck like we do, you can find tickets for any of the Thursday Nights at the Asylum right here. 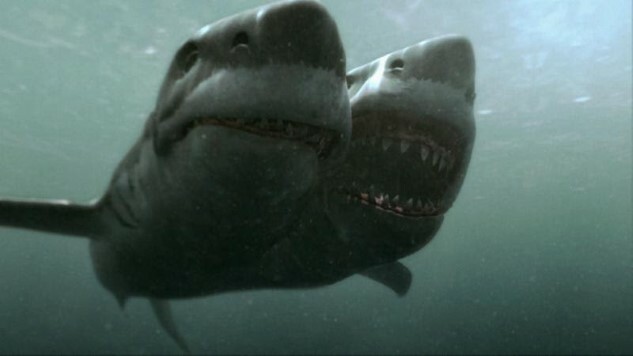 Also below: A full list of all the theaters screening 2-Headed Shark Attack.